(Monarch Caterpillar (Danaus plexippus) - 01) This photo was submitted to us by Gretchen Roberts, Vero Beach FL. 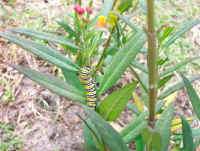 She wrote: "These are my first Monarch caterpillars to be drawn to my (once neglected) butterfly garden. I'm so excited and wanted to share!!!" When the monarch butterflies return from their southern migration to Mexico, and possibly other location, they lay their eggs on milkweed plants. The eggs hatch in about 3 to 5 days as the 1/8 inch long baby caterpillars eat their way out of the eggs and begin to dine on the milkweed. (Monarch Caterpillar (Danaus plexippus) - 01a) This is a closer look at a few of the monarch caterpillars in the photo submitted to us by Gretchen Roberts. The baby monarch caterpillars eat almost continuously until they literally outgrow their skins, which they shed several times before maturing to about 2 inches in length. This whole growth process takes only 1-1/2 to 2 weeks. (Monarch Caterpillar (Danaus plexippus) - 02) This is another of the monarch caterpillars photos submitted to us by Gretchen Roberts. 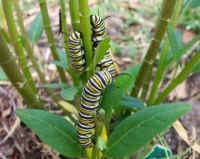 The monarch caterpillar only eats milkweed. In our area of the country, we have seen very few monarch butterflies in recent years, and have observed no monarch caterpillars, which makes Gretchen's submissions doubly appreciated.